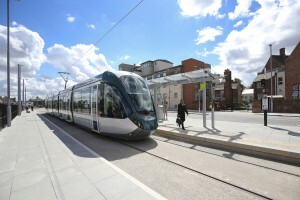 On 25th August 2015, the new Tramline opened in Beeston, connecting us to Nottingham City Centre. There are a number of stops within Beeston town centre including Chilwell Road, Beeston Centre and Middle Street and trams run every 7 minutes through the town. Beeston can be reached from both the A52 and also the A6005 and is signposted from both approaches. Parking in the town centre in all town centre car parks is FREE for the first hour and is a maximum of £3 for all day. For more information, including a list of the car parks in the area, please visit Broxtowe Borough Council’s Beeston Car Parks. Our 2 major supermarkets Tesco and Sainsbury’s also offer a number of hours of free parking. Beeston train station is a 10 minute walk from the town centre (along Station Road). Regular trains run to and from the station. If you would like to contact the Lets Go To Beeston team, please fill in the form below with your query and we will get back to you as soon as possible.